It’s the highly-rated, first libertarian science fiction anthology in a decade. 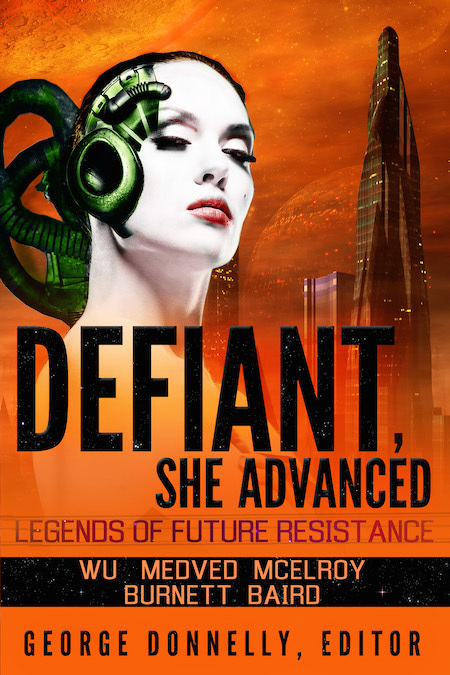 For a limited time, Liberty.me brings you Defiant, She Advanced: Legends of Future Resistance FREE to Liberty.me members. Download it now or sign up for an awesome Liberty.me membership. I popped the top on my hoverboard-mounted plasma-quarkon displacement diverter and dropped down to the murky ooze that is Washington, DC, circa 2099. The fall was farther than expected and I twisted my ankle something awful, the pain shooting up my leg like a hot nano-laser bolt. That’s when the idea came to me. I’d write a book with seven other libertarians. That kind of pain would definitely make me forget about my sprained ankle. Because, you see, the myths of the gods tell us that libertarians are problematic, particular and pecunious people who enjoy eating their young and couldn’t agree on where to dine, much less the contents of a science fiction anthology. “Getting libertarians to work together is like herding cats.” So sayeth the great pre-ancient philosopher-king Murricus Rothabardius. As a firm devotee of that wise mind of old, I knew he was right. It was the perfect diversion to get my minds off that darned organic ankle – which I had to get replaced at my next checkup and lube. It was the grand airship adventurer J.P. Medved who first signed up for the daring expedition into the dark heart of these fickle, serial-ostracising libertaires. He docked his dirigible outside my window at first light one morning and saluted me, a stiff frown hanging beneath his monocle and pointed helmet. “Count me in,” he said in that old high-German accent of his. In short order, Tom-Cruise-from-The-Firm lookalike Jack McDonald Burnett signaled his intent to acquire rights in the venture with a 300-page prospectus. I immediately signed and got my signature notarized, as requested. In retrospect, however, I have found some unusual clauses in there that we need to talk about, Jack! Then it was the famous hunter-trapper outdoorsman Jonathan David Baird who pegged his finished story – composed in one fluid draft on the underside of a raccoon pelt – to my front door early one morning with his prized Bowie knife. A long while passed after that. I fell into a funk while on a trip to China. I would never finish this. I had chosen to deal with libertarians! It was impossible! Mother warned me about these people. The State Department put out a travel alert about these infighting-infested fanatics! What was I thinking? We had to fight our way through a lot of big-talking old gas bags. But we did it. Ask me for the story sometime. But it was all for naught. Our heroes were too few in number. Libertarian science fiction authors are an endangered breed, something I dared not reveal to the hunter, Baird. I considered approaching Burnett to see if we could get a bill through the legislature to protect our kind, maybe even a state subsidy or protected wetland for artistic workshops. But that’s when the last heroes of this tale came ‘round the dusty mountain trails of my dragon-doomed stronghold. First was Wendy McElroy in her tall wizardly hat and form-fitting business dress. She wielded the Staff of Individualist Anarchism and Feminism – and wielded it well. “I will join your quest,” she intoned across the magnificent field, blooming anew with daisies. “Welcome you quite heartily, I do, Great and Wise Wizardress. With you, our company is complete and we may set off,” I said. But before we could unite the host and take the first step of our journey, two new authors joined us, cute as a button both of them and eager to enhance our solemn endeavor: the mysterious Jake Antares and the earnest Robert S. Hirsch. Together, we walked into the sunset, sang songs, signed contracts, read each other’s magnificent tales aloud and were merry. “The legends speak of libertarians who could not harmonize,” I said to my assembled champions, “but we are a merry band!” We raised our cups and cheered a toast, our frothy mead overflowing to the fertile soil below, that all libertarians everywhere may be happy and enjoy their free copies of our finished work: Defiant, She Advanced: Legends of Future Resistance, the first libertarian science fiction anthology in a decade, now available for free on Liberty.me for a limited time. And all was right in the universe once more. 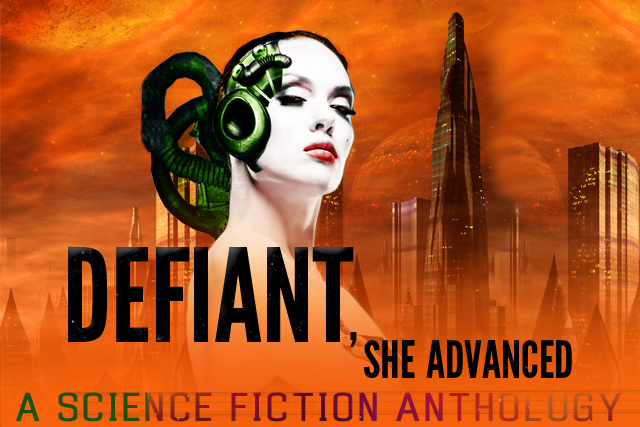 » Download your free copy of the Defiant, She Advanced libertarian science fiction anthology now.